Moritaya Ryokan is located in the Bandai-Atami hot spring area. Our Japanese-style inn is a family business that offers 9 comfortable rooms. 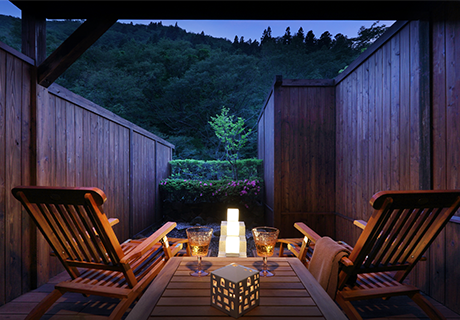 The inn is a modern Japanese-style building nestled among woodland and mountain streams. 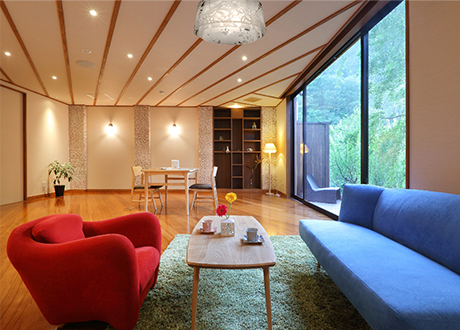 The unique design features an interior based on Japanese beauty and a cafe for guests with a Northern European style. All guestrooms have an attached private bath enabling guests to enjoy the hot spring at any time of the day or night. 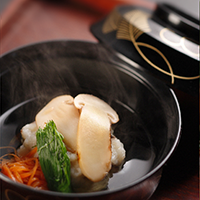 Guests can appreciate the attentive customer service and sophisticated, authentic Japanese cuisine that is exclusive to our small inn. Check-in for guests not requiring dinner is until 9:00 p.m.
Guestrooms feature basic Japanese architecture and interior design with modern arrangements. 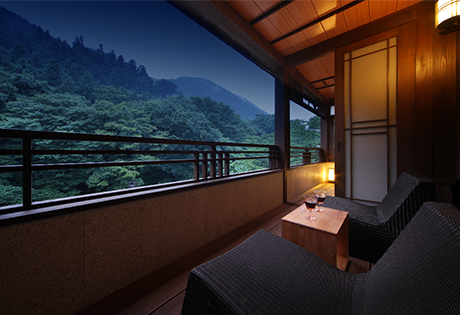 Guests can take pleasure in staying in surroundings abound with the ambience of Japan. There are 7 types of guestrooms, each with a unique character. You are free to choose a room of their liking. 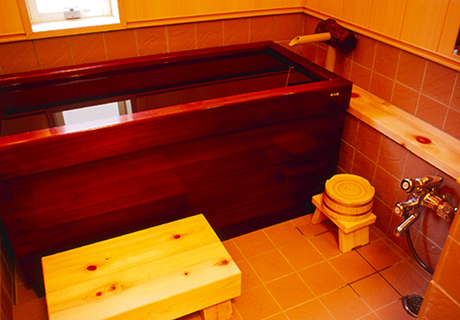 All guestrooms at Moritaya have attached private baths. 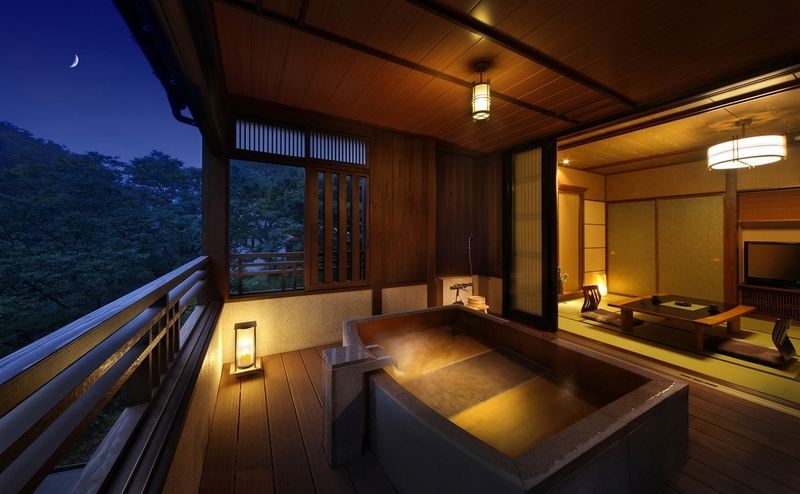 Enjoy the hot spring and beautiful scenery from your own room. This is Moritaya’s most luxurious suite. It offers a spacious Japanese-style room and bedroom, and the high-quality bed mats promise a comfortable slumber. This is Moritaya’s second most luxurious suite offering a Japanese-style room and bedroom. The deluxe open-air bath made of cypress is popular with guests. This guestroom features a barrel-shaped open-air bath made of cypress that looks out upon mountain streams and greenery for a relaxing respite. This guestroom features an unusual open-air bath made of cypress that allows the bather to lie down in the bath. It looks out upon mountain streams and greenery for a relaxing respite. This guestroom has an open-air bath with a spacious terrace. The bath uses stones to create a polished appearance. The room is popular with guests. This standard guestroom has a quiet atmosphere and looks out on mountain streams. The open-air bath made of cypress or ceramic offers a relaxing respite. This standard guestroom has a quiet atmosphere and looks out on mountain streams. The stylish stone, open-air bath affords a full view of the nearby streams and greenery. There are 2 baths at our inn that can be reserved for private use free of charge. Feel as if you are bathing in the midst of a forest in the open-air bath, “Mori no Kakurenbo.” Or, try the lacquered Japanese cypress bath with free-flowing hot spring water. Be sure to enjoy the different elegance that each has to offer. 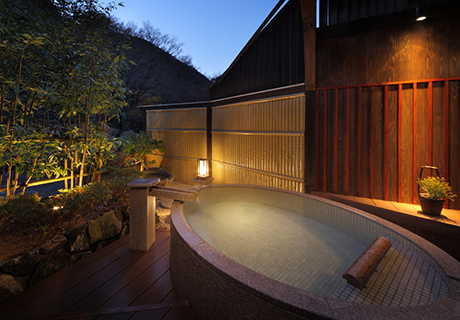 From the open-air terrace next to the open-air bath, “Mori no Kakurenbo,” guests can gaze at the forest and moon while listening to the murmur of the stream. There is also a large bath made of Japanese cypress that looks out upon small brooks. 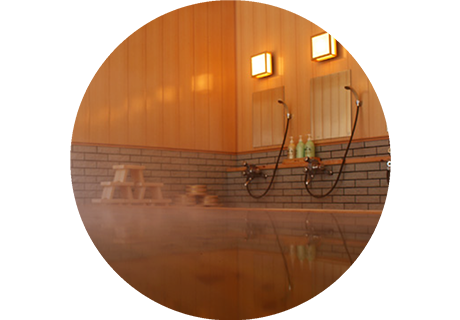 Though our inn is small, we have numerous hot spring baths that can be enjoyed to your heart’s content. Bathing in the soft hot spring water is said to make you beautiful. The high-quality hot spring water originates from natural water in the Adatara mountain range that has soaked into the subsurface while picking up minerals over a period of 130 years. The clear, slightly fragrant hot spring water lacks any peculiar qualities and is liked by all. Relief from fatigue, rheumatic disease, motor disabilities, neuralgia, cuts, etc. We take great care with food safety, preparing foods that are fresh and delicious. We only use fresh ingredients that have passed stringent safety inspections and have been procured from trustworthy businesses. 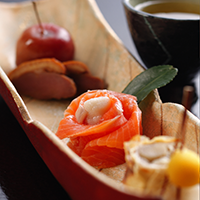 Guest can enjoy traditional local dishes from the Aizu region and creative cuisine unique to our inn. 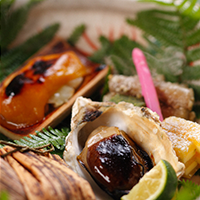 In addition, we use tableware made from the traditional craft, Aizu lacquerware so that you can enjoy gorgeous food arrangements and dishes both with your eyes and palates. Copyright (C) 2018 MORITAYA. All Rights Reserved.